LAWRENCEVILLE, GA - To enhance the safety of fans at Coolray Field, the Gwinnett Braves have partnered with Netting Professionals of Fernandina Beach, Fla. to install a new, expanded protective netting for the 2017 season. Installed on February 7, the state-of-the-art PRO-16 / PRO-9 Dyneema™ netting system consists of a 30-foot-tall by 160-foot-wide backstop net, plus two additional 80-foot-wide nets that extend to the end of both the Gwinnett Braves' dugout and the visiting team's dugout. 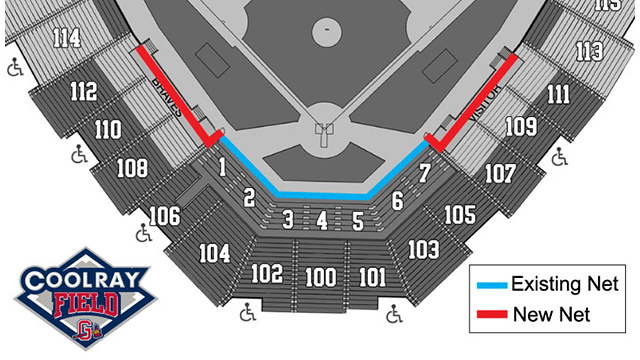 Netting coverage has been increased from seven sections (1-7 in the Home Plate Club) to more than 11 sections close to the field (now covering Dugout Seats in sections 107-110 and parts of 111 and 112). Spans approximately 320 feet from end to end, an increase of 175 feet over the previous 145-foot backstop. Has a minimum break strength of 350 pounds behind home plate and 200 pounds behind both dugouts. Offers a 3% increase in visibility behind home plate (now 93%, over the previous 90% visibility). Nets over the dugouts offer an even better visibility of 97%. "There is no greater priority than the safety of our fans," said Gwinnett Braves General Manager North Johnson. "Coolray Field's new protective netting will provide a safer atmosphere to watch the game without sacrificing the close-up views of the players on the field that fans enjoy." The Gwinnett Braves open the 2017 season at Coolray Field on Thursday, April 6 with a 7:05 p.m. game against the Durham Bulls. Season ticket packages are available for purchase now by calling the Coolray Field Ticket Office at 678-277-0340.